« Persistent Question: Why are meals offered in only one size? This entry was posted on November 2, 2007 at 3:17 am and is filed under Destinations with tags celebrity chefs, Las Vegas, questions. You can follow any responses to this entry through the RSS 2.0 feed. You can leave a response, or trackback from your own site. got to emril’s place at the MGM – dining at the bar is a great option if they’re booked. I’m a Thomas Keller whore, so I’d say Bouchon, especially if you haven’t been to the one in Yountville yet. I’ve also been dying to try Daniel Boulud’s food, so I’d probably go to his place. My wife has been to Emeril’s place in the MGM and she said it’s good. 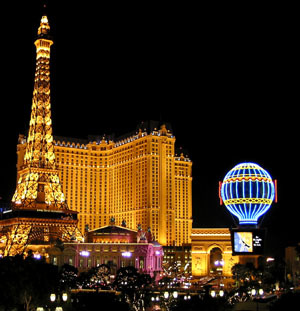 For buffets, the one in Paris is pretty good for the money, and Bellagio’s is the best…and priciest. Thanks for the very helpful suggestions! Well, I went to Bobby Flay’s restaurant one of the last times I was there. It was pretty good, but not outstanding! Go to Bouchon and order the appetizer that’s the salmon spread. (I’m totally blanking on the exact name of the dish right now.) Truly one of the best things I’ve eaten in a long time. The rest of the meal was excellent, as well – I heart Thomas Keller! Of course I’m biased, but save your trip to Commander’s Palace for the real one in New Orleans. Being so iconic to the New Orleans dining scene, it has an ambiance you just can’t recreate. Thanks for your tips everyone! I will definitely keep them in mind when I head to Vegas…of course I want to try them all! For a really big splurge, there are a couple of restaurants that are a cut above those you mentioned. Guy Savoy in Caesar’s Palace is one. Joel Robuchon’s place in the MGM Grand is another. Those guys have both held 3 Michelin stars at one point or another. If you’re willing to drop serious dime, that’s where I would go. Doesn’t Michael Mina have a place or two there? Definitely not Emeril’s, and I’ve heard the Vegas Bouchon is way sub par than the Yountville one. There’s also a place called Rosemary’s that’s not on the strip but is apparently an excellent restaurant. I know how you looove a good steak. Darren’s favorite restaurant in the world is Prime at the Bellagio, for the steak. Start working on your appetite. I love it!! Thank you for that suggestion! Nice blog..thanks for the information..